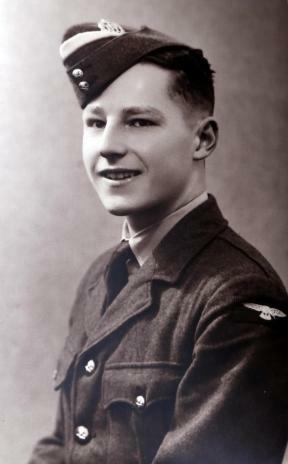 Sergeant Norman Douglas came to 419 squadron with P/O Vaillancourt's crew on February 27th of 1943. In his trade as Bomb Aimer he participated in nine missions. Although his record shows only seven, as two operations were not completed when mechanical failures caused the captain of the aircraft to return to base before completing the operation. On his ninth time out while flying in Halifax serial number W7817 which was their constant kite on all their operations except one, the crew were attacked without warning from their Monica rear radar device. The surprise attack of the Me110 proved fatal. The rear gunner Sgt. Stanley of Vancouver was killed and Sgt. Jayne was knocked out by the explosion of an oxygen tank near his post. A second pass by the fighter knocked out the intercom, inner port engine and started a fire near the rest position inside the Halifax fuselage. With the wings starting to catch fire the signal to bail out was passed by the crew. All the crew managed to escape the falling Halifax, with only the fatally wounded rear gunner Sgt. Fredrick Thomas Stanley having to be left behind. The crew managed to elude capture for a short time before being turned in by local villagers to the German authorities. Sgt. Douglas remained a prisoner until finally being abandoned by guards on one of a number of forced marches he was part of. To his family, as with many veterans he never mentioned his experiences while at camps in Lithuania and Pomerania. Although in his last few years he began talking about his captors and being under nourished, during the years of imprisonment but the part that stuck with him the most, was the men who died during those forced marches as war neared it's conclusion. Returning home to the Darlington area and working as an ordinance surveyor, where he married and raised a daughter. On July 14th, 2014 Norman Douglas passed away at age 91. His funeral was attended by family members and an RAF flag bearer in Darlington.